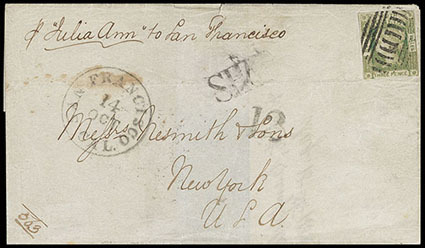 New South Wales, 1852, Queen Victoria, 3d green, medium paper, margins to touched, tied by barred oval, matching "Sydney, New South Wales, AP * 7, 1854" rimless crown backstamp on blue folded cover to San Francisco Cal., endorsed "pr Magnolia" at top left, entered mails with "San Francisco Cal., 24 Jun" cds and matching "Ship 6" clamshell due handstamp, Very Fine. Scott No. 17. SG No. 66 Estimate $400 - 600. 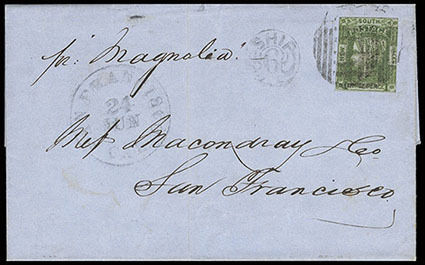 The "Magnolia" arrived in San Francisco June 23, 1854, 72 days from Sydney. 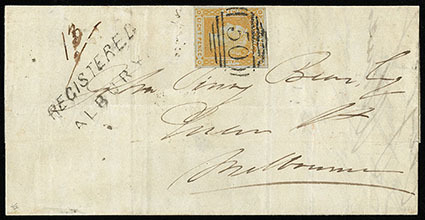 New South Wales, 1852, Queen Victoria, 3d dull yellow green, medium paper, margins to touched, tied by barred oval, matching "Sydney, Ship Letter, AU 15, 1856" rimless crown backstamp on gray folded cover to New York N.Y., endorsed "P 'Julia Ann' to San Francisco", entered U.S. mails with "San Francisco Cal., 14 Oct" cds and matching "SHIP" and "12" rating handstamps; minor stain, otherwise Very Fine. Scott No. 17d. SG No. 67 Estimate $400 - 600. Barque "Julia Ann" arrived in San Francisco Oct. 12, 1853, 56 days from Sydney via Tahiti. Scarce transpacific routing to New York verse the more typical via England. 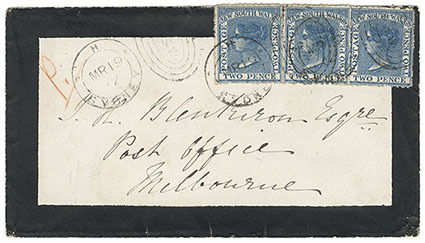 New South Wales, 1871, Queen Victoria, 2d Prussian blue, perf 13, Small Crown & NSW watermark, Large Crown & NSW watermark, three singles, tied by "Sydney, MR 19, 72" duplex postmarks on 1872 mourning cover to Melbourne, red crayon "P.", Melbourne (3.22) arrival backstamp; flap tears, Very Fine and attractive use. Scott No. 53 var. SG No. 209 Estimate $200 - 300. 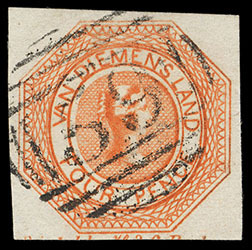 Tasmania, 1853, "Van Diemen's Land", 4d orange, plate I, 2nd state, neat barred "59" oval cancel, large margins showing part of imprint in bottom margin, intensely rich color, Extremely Fine and choice, a wonderful gem, ex-Consul Weinberger. Scott No. 2a. SG No. 8 £450 ($590). 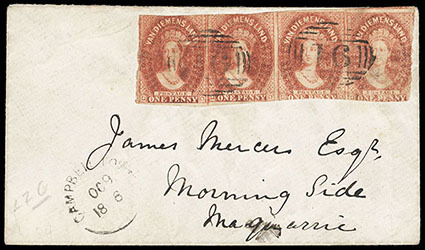 Tasmania, 1865, "Van Diemen's Land", 1d dull vermilion, imperf, horizontal strip of four, Double-lined Numeral watermark, margins huge to in at bottom right, canceled by "16" in barred oval with impression through to reverse of cover affecting tying stamps on cover to Macquarie, matching "Campbelltown, Oc 9, 1866" cds; left stamp with tiny facial nick, otherwise Very Fine, ex-Seybold. Scott No. 11a. SG No. 28 Estimate $200 - 300. 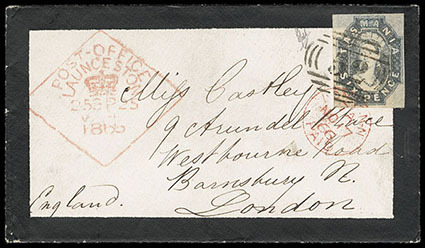 Tasmania, 1863, Queen Victoria "Chalon Head", 6d gray violet, imperf, remarkable large margins all around and rich color, tied by neat "52" barred oval handstamp on mourning cover to London, England, clear red diamond "Post-Office, Launceston, 25 SP, 1866" crown origin handstamp and red "London, Paid, No 17, 66" receiving cds additionally tying stamp, Extremely Fine and choice, an exceptionally choice stamp and cover; signed Holcombe. Scott No. 14. SG No. 46 Estimate $500 - 750.